Bushfire Certifiers is a multi-disciplinary bushfire consulting firm that provides a complete range of bushfire assessment services. Our team comprises highly qualified and experienced building surveyors and a BPAD – Level 3 Accredited Practitioner capable of preparing Bush Fire Threat Assessment Reports to comply with both the acceptable solutions and the performance criteria of state based legislation. We have an extensive client list that includes government, private developers, commercial builders and international corporations. 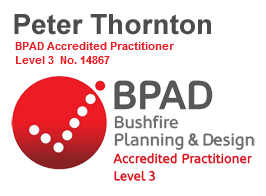 Bushfire Certifiers success to date has been as a result of leading edge methodologies to resolve problems, experienced in all areas of building design and construction, technical expertise and having a comprehensive understanding of the bushfire regulatory environment. What sets us apart is our commitment to finding alternative solutions that provide our clients with economical solutions. Recent projects include re-zoning developments, subdivisions, alternate solutions for infill development, new dwelling or alterations and additions and special fire protection purpose development. Our Values include: integrity, professionalism, our people, lasting relationships with clients, innovation.